This lovely luxury camping site is right on the shores of the famous Lake Garda, a much sought-after location in the north of Italy. This family-friendly campsite is surrounded by lush greenery and plenty of pretty towns and villages to explore. It has a range of facilities on-site that help to make your holiday a relaxing one. Unwind in a comfortable mobile home bookable through LuxCamp before heading out for a great day full of activities. This site will feel like a home away from home, thanks to its friendly staff and delicious hearty food. It's the ideal luxury camping experience for families, thanks to the range of fun sports and activities on offer. 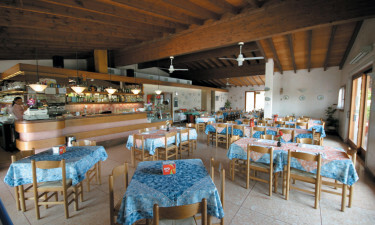 Plus, it has plenty of shady spots for adults to take some time out and enjoy the Italian sun. There are so many reasons to choose this scenic campsite, right by the Dolomite mountains. There are three pools to enhance your camping holiday, one main pool and two for children. Each has a large area with parasols and sun loungers. 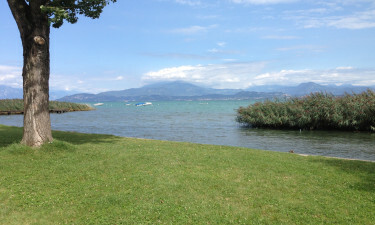 Tiglio has its own jetty leading directly to the water, but there is also a lovely lakeside beach just 1.5km away, with calm blue waters for swimming.